Themes of justice, inequality, commemoration, and environmental stewardship will be explored in the classroom and through campus programming. “From contrasting cultures of protest to debates about monuments, Richmond has much to share and learn from our peers in South Africa,” said Martha Merritt, dean of international education. “Our goal of international education week is to expand knowledge and our ability for partnership by ‘meeting’ in a culture in which so many of us find related experience. A highlight is photographer Johnny Miller’s talk and photos of inequality in Richmond and cities in South Africa." This annual festival of contemporary film features a selection of the most highly-acclaimed work produced throughout Africa and celebrates African culture through cinema. Free and open to the public, both UR and the greater Richmond communities have the opportunity to explore South African culture through the realm of filmmaking. The full schedule can be viewed on the festival website. 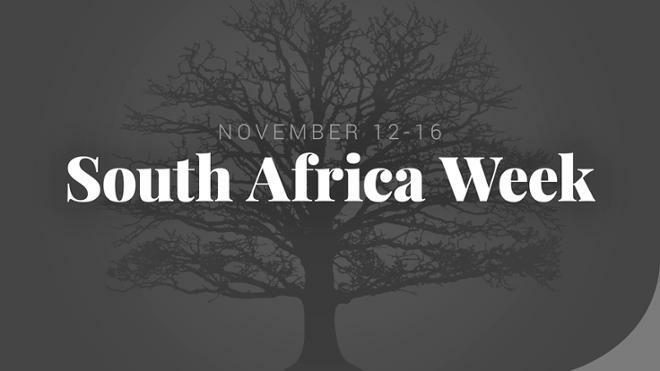 South Africa Week will kick off with a walk across campus named in honor of South Africa’s national animal, and rugby team mascot, the springbok, a type of antelope. Members of the campus community will gather at the Forum as local dancers, drummers, and those who have lived in South Africa lead the campus community to the International Center Commons for a continental breakfast and short program highlighting events and themes for the week. Walk participants will be dressed in festive accessories that speak to South African arts and culture. Socks, hats, or scarves with colors or patterns from the national flag, Springbok rugby gear, and patterned and colorful textiles will be on display. The greater Richmond community is invited to join the campus community for a scenic and reflective walk across campus, starting at the International Center with sung “call and response”. The walk, marked by illuminated trees, will feature pop-up stations that will highlight South African culture and influence, including protest, children’s literature, sport, and travel. Participants will explore themes of justice, reconciliation, commemoration, and environmental stewardship. The walk concludes with a South African dinner at Heilman Dining Center featuring authentic recipes of South African fare. See the dining hall website for special dinner rates. For more details on South Africa Week visit the International Education website.